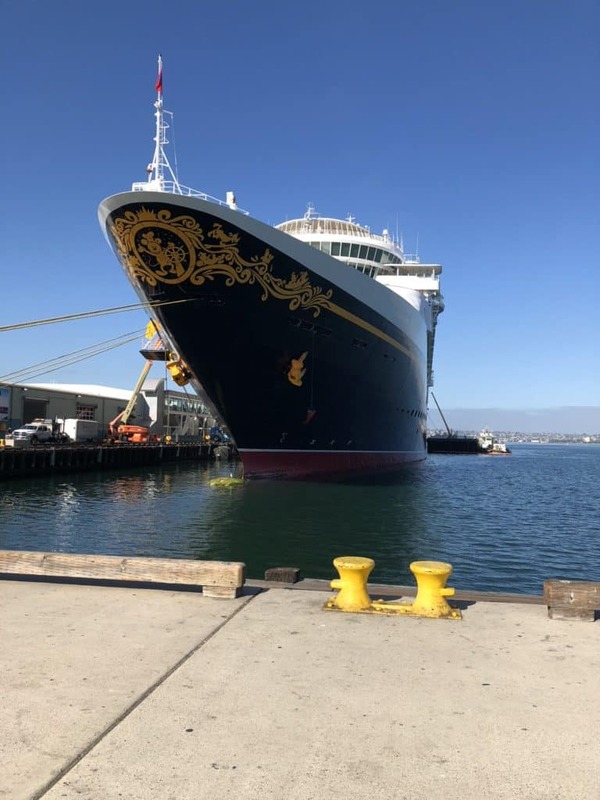 The last day of our Disney Wonder San Diego Cruise is a port day in Ensenada. As I have sailed many times to Ensenada this is going to be a day spent on board the ship. This really has been one of the most relaxing cruises I have ever taken. 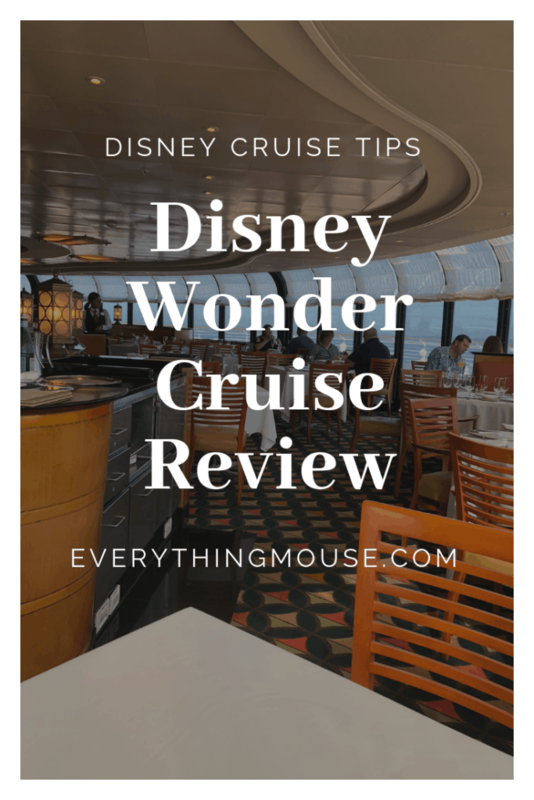 It certainly proved that a Disney cruise for adults has a lot to offer. 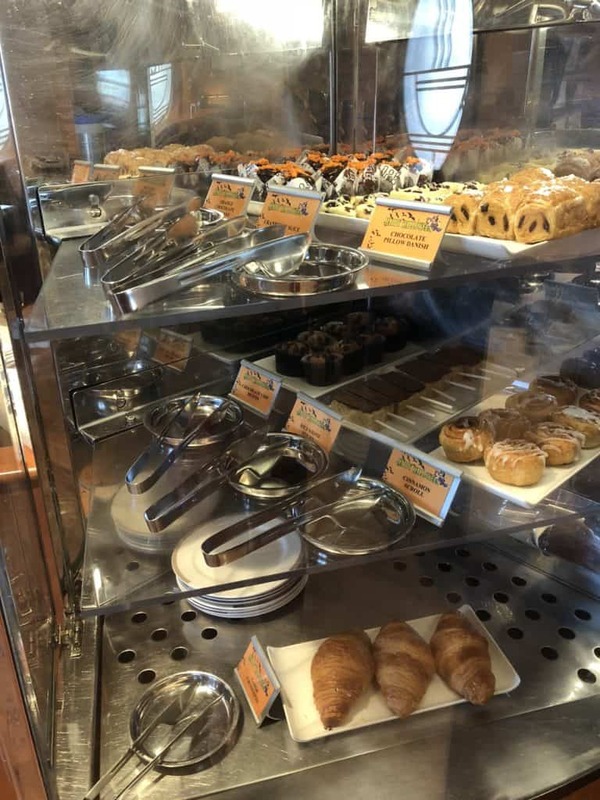 One thing that you can definitely say about a Disney cruise is that you will never go hungry! We decided this morning to skip Cabanas buffet and go to Cove Cafe for breakfast. Cove Cafe is usually open from 6.30 am on port days and 7.00 am on Sea Days. 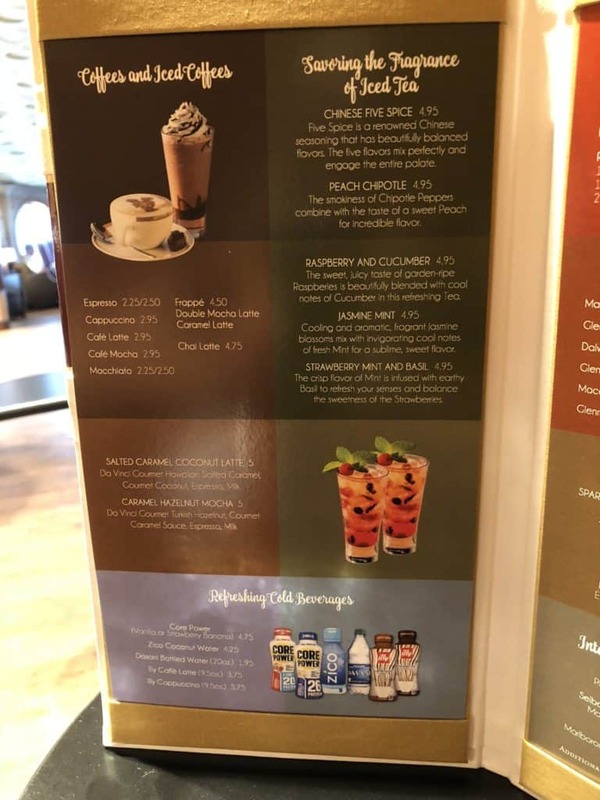 Cove Cafe is usually one of the quieter places on the ship. This time there seemed to be even less people in there any time of the day we went in. We both got a specialty coffee. The Mocha is $2.95 and a Cappuccino costs the same. You can get fancier creations, but it was early i the morning! 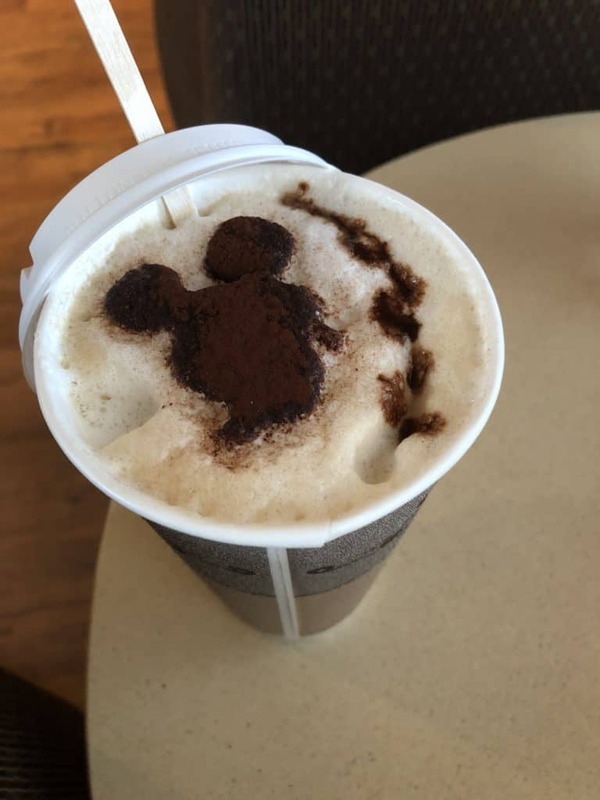 Mine even had a not so Hidden Mickey. I admit I was tempted by the pastries on offer but I decided to pass. These is no charge for the snacks in the Cove Cafe. 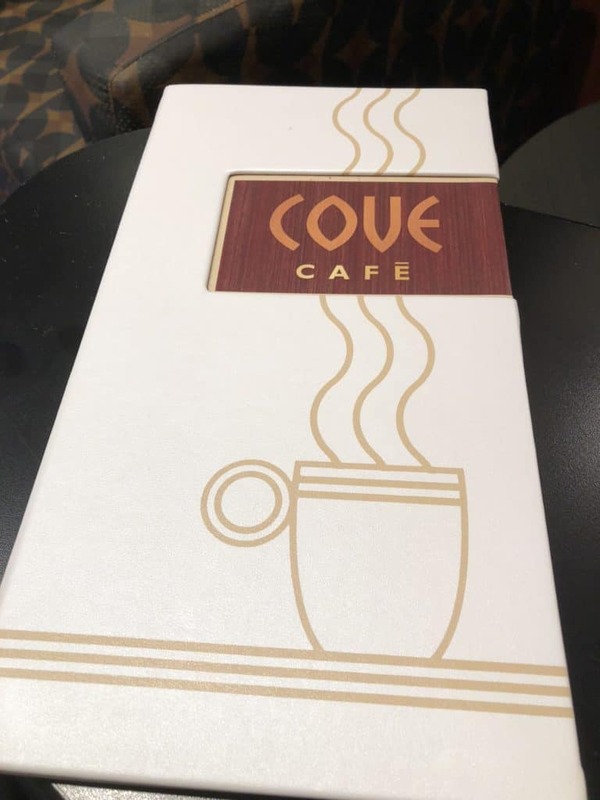 Remember to get a coffee card for the Cove Cafe. If you buy 5 beverages your next one is free. The card says that it is not transferable between cruises. 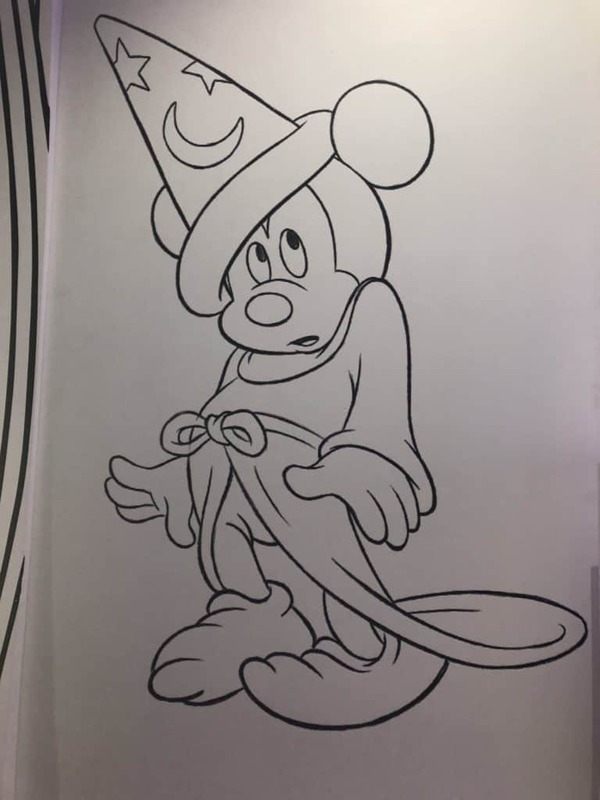 However, I had saved this one from my last Disney cruise and they still accepted it. There is a selection of books and magazines in the Cove Cafe. However, they really aren’t anything to get excited about. The books are in a small cabinet and it always seems like there are a couple of shelves barely full. THe selection of magazines didn’t keep me occupied for very long! What to do next? 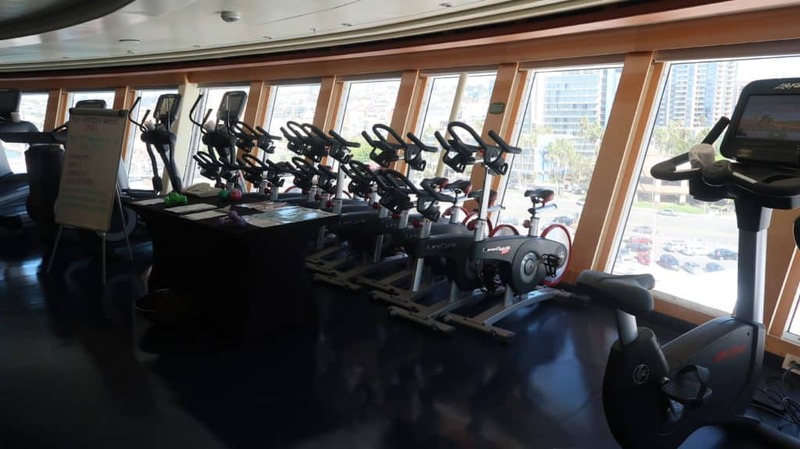 I decide to go and take some pictures around the ship while DH goes to the gym. He has really been very disciplined about it and visited the gym every day. He said that rarely has it been busy on any day of the cruise. We decide that we will meet in the Rainforest Room as usual. We really have spent so much time in there it was well worth the extra cost. . 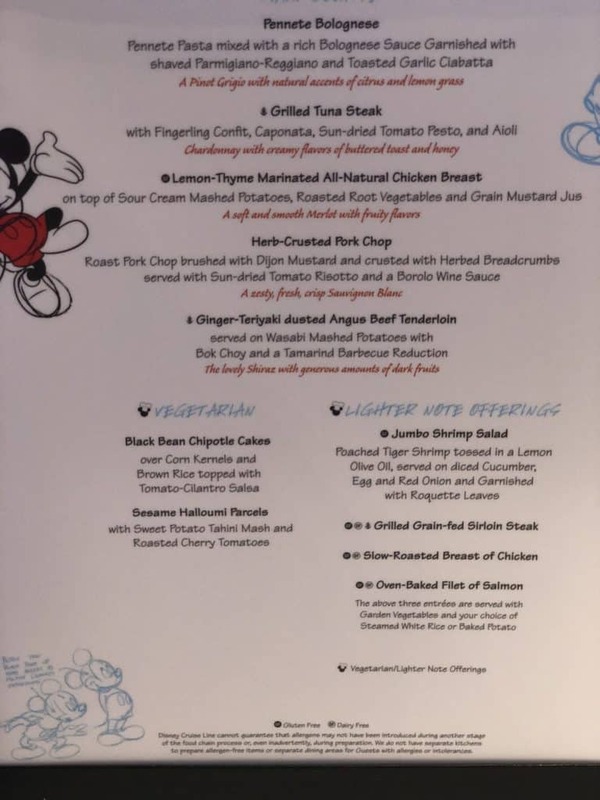 If you are sailing for the first time on the Disney Wonder I would suggest that you get at least a day pass to the Rainforest Room. If you have sailed on the Disney Fantasy or Dream and used the Rainforest be prepared to be underwhelmed. 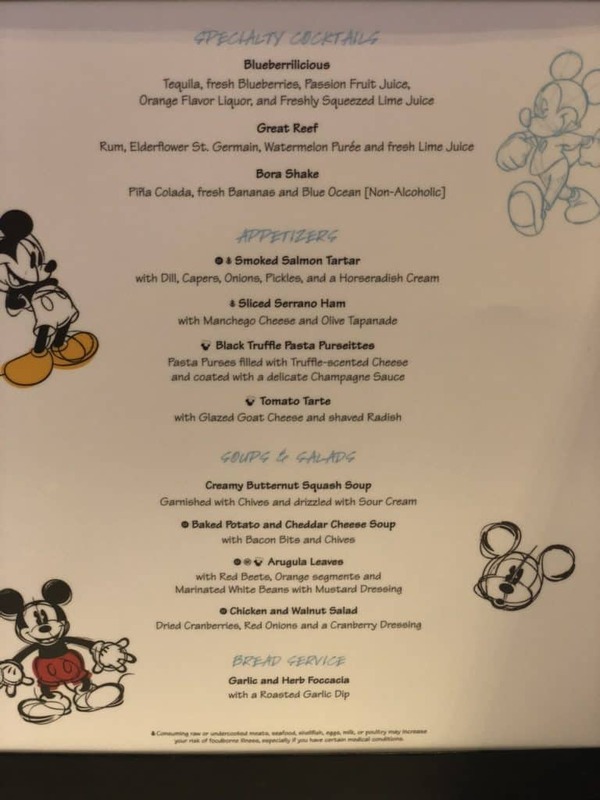 We enjoy all the Rainforest Rooms but it really doesn’t seem right that the charge on all the Disney ships is the same. They really aren’t comparable in terms of facility. 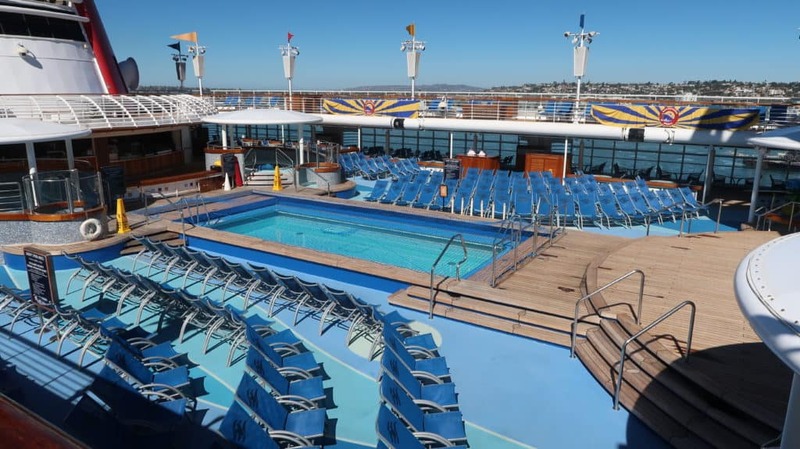 Other cruise lines have different charges for their similar facilities on different ships. 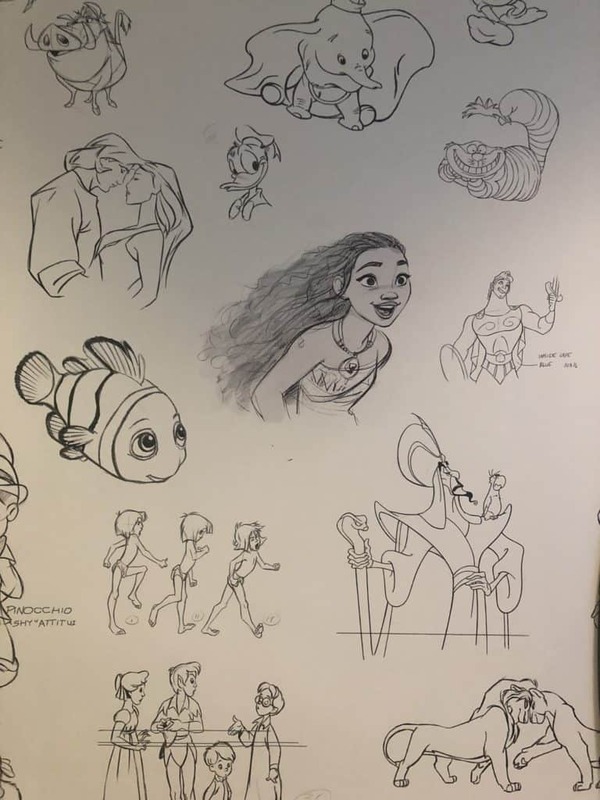 I imagine that the Rainforest Room on the new Disney ships will be stunning. I predict that it will have a huge picture window with the heated stone chairs and hot tubs overlooking the ocean. 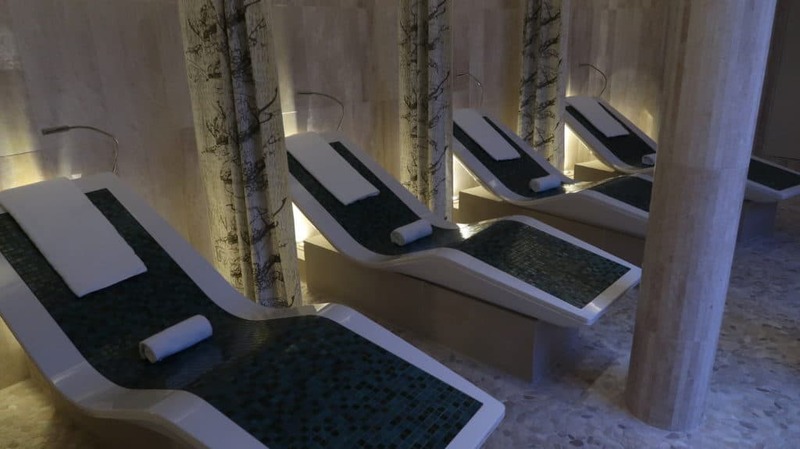 Also I would guess they will have a large thermal style pool. I wonder if they will have a snow room. 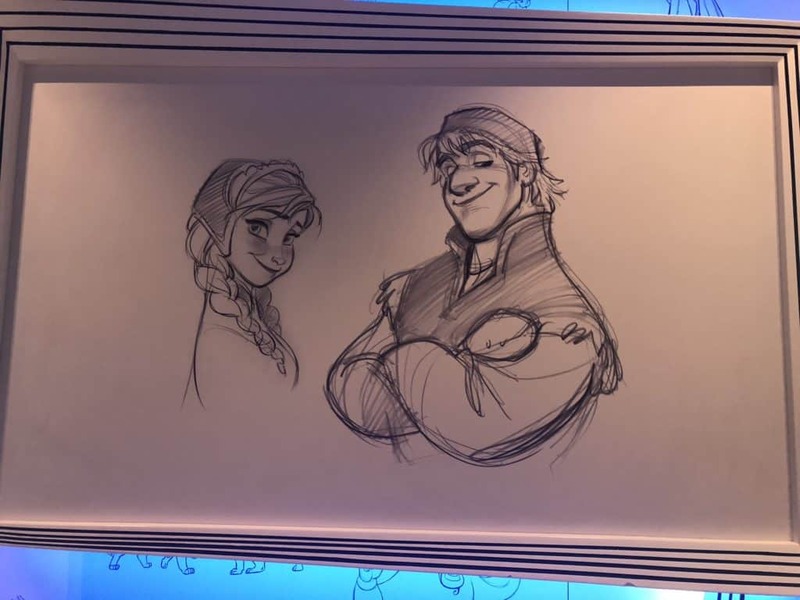 Disney could tie it in with a Frozen theme. Just kidding! Once again we followed our routine of going into the Cove Pool after the Rainforest. It was pretty busy considering it was a port day. 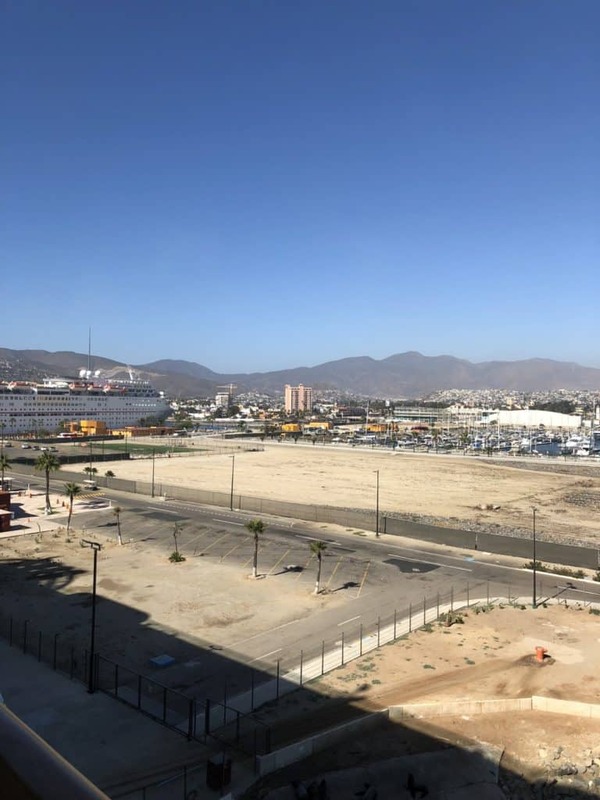 However, a lot of people do choose to stay on the ship in Ensenada. We sat out on the stateroom verandah for a while. 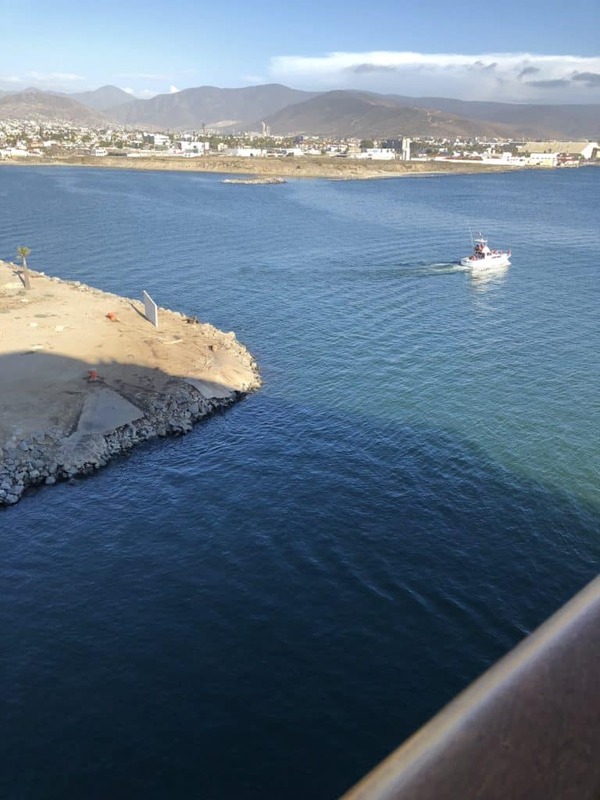 Ensenada is not the prettiest of ports, but it was nice sitting out there on the balcony. I wonder what that huge patch of empty ground is used for? It seems like a wasted opportunity. I am sure that if there were a few souvenir places and somewhere to grab a margarita it would be a huge success! The weather for this cruise has been perfect. The temperature in the day was usually around the low 80s. Perfect weather for the pool. I realized that on this cruise I had barely even seen the Family Pool. Even when I have the boys with me we don’t tend to spend that much time in that pool. The Goofy Pool is way too small for all the guests who want to use it. The pool rarely looks like this! I think the one time we have spent a lot of time in there was when we sailed on the Panama Canal cruise in 2014. There weren’t as many children on board, so it just wasn’t as crowded as it usually is. Funnel Vision is always good fun though, particularly at night. They cover up the pool and put the lounge chairs out. Don’t forget to grab a blanket if it a bit cool in the evening. One of the places I do wish we had spent more time in was the Cadillac Lounge. On previous Disney Wonder cruises I had rarely gone in there. The Disney Wonder dry dock brought some great improvements. 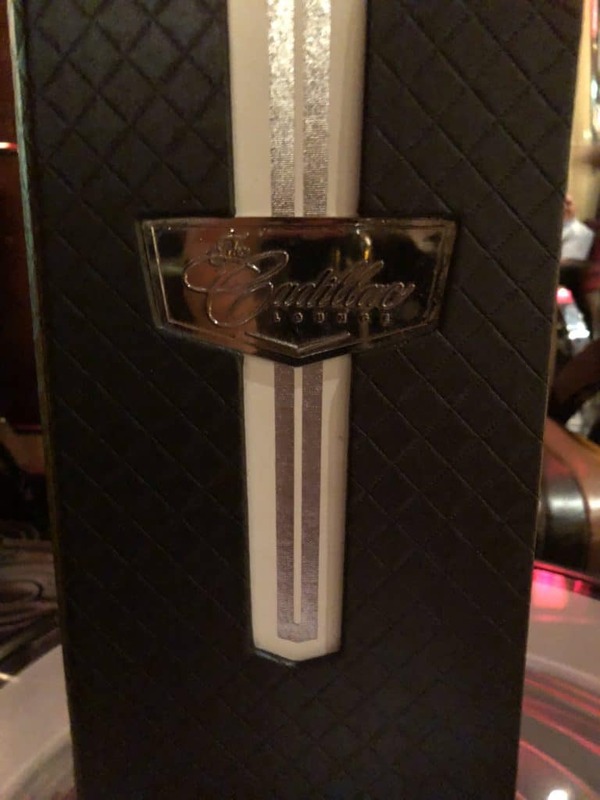 The redesign of the Cadillac Lounge was one of them. I am glad that I tried the Sommolier Bin. This is a little known feature of the Cadillac Lounge. 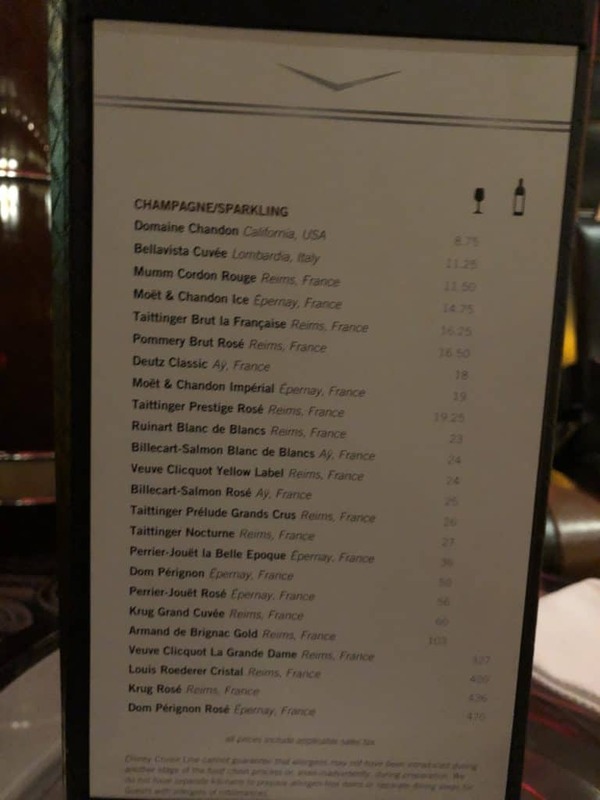 You pay $10 for a glass of red, white or sparkling wine. 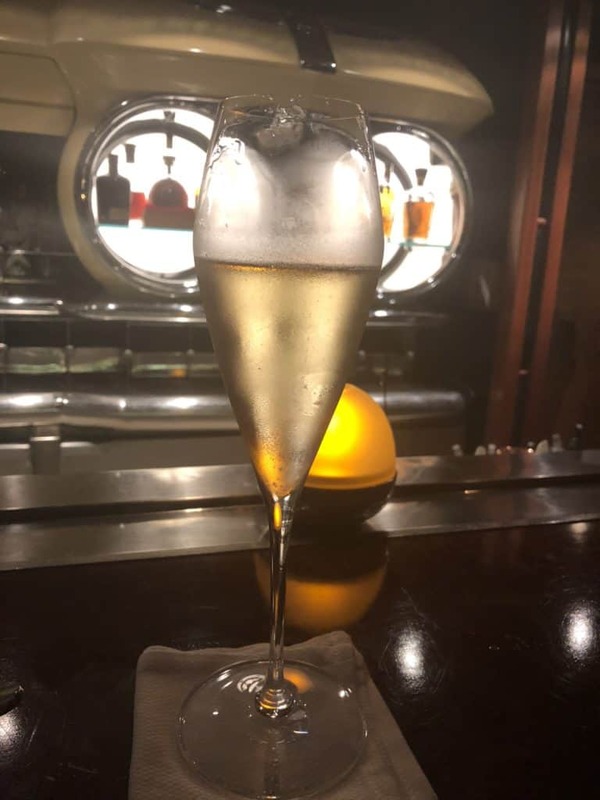 The actual drink that you get is a surprise as the bar tender gives you what they have available from an open bottle. 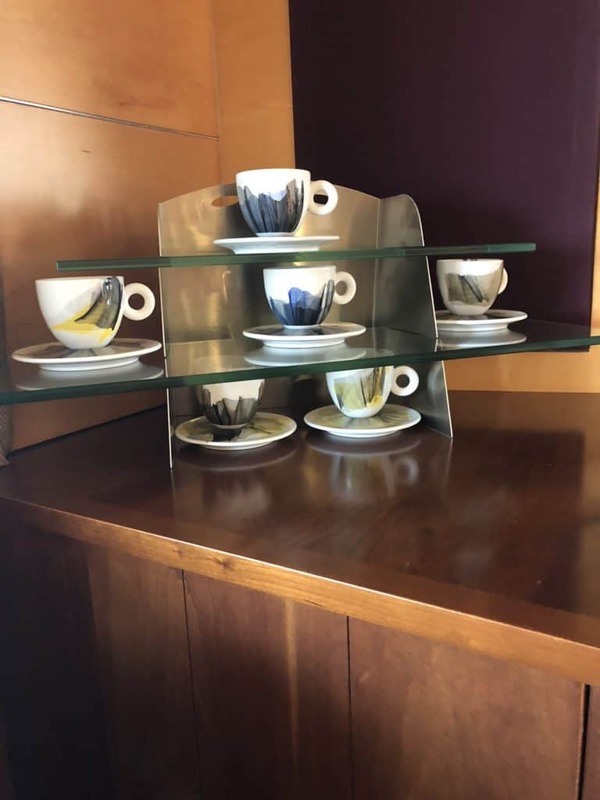 It is a great idea for the guest as they may get a much higher valued glass. 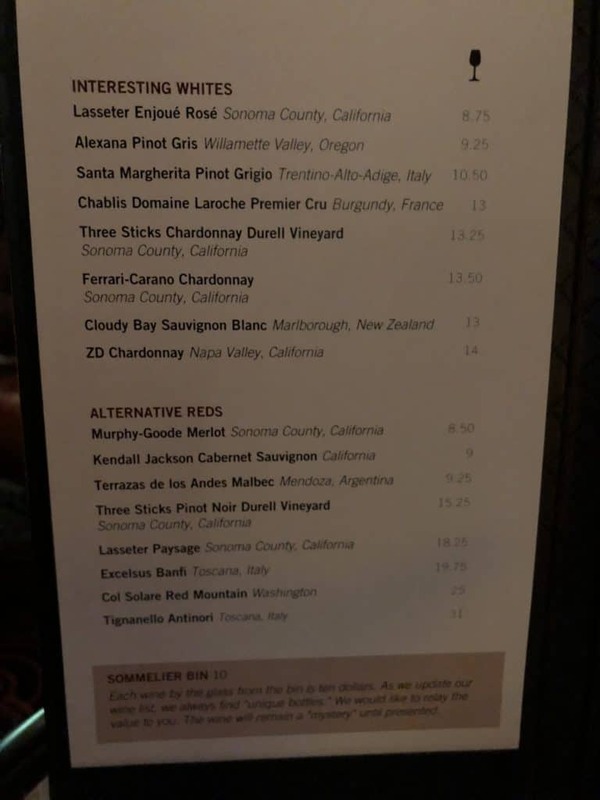 It is also a good idea for Disney as they get to use up open bottles of wine which may have to be thrown out if they are not used that day. I was very pleased as I got the Veuve Clicquot Yellow Label. This is usually $24 so the $10 Somolier Bin was a bargain! Soon it was time for our final dinner of the cruise. 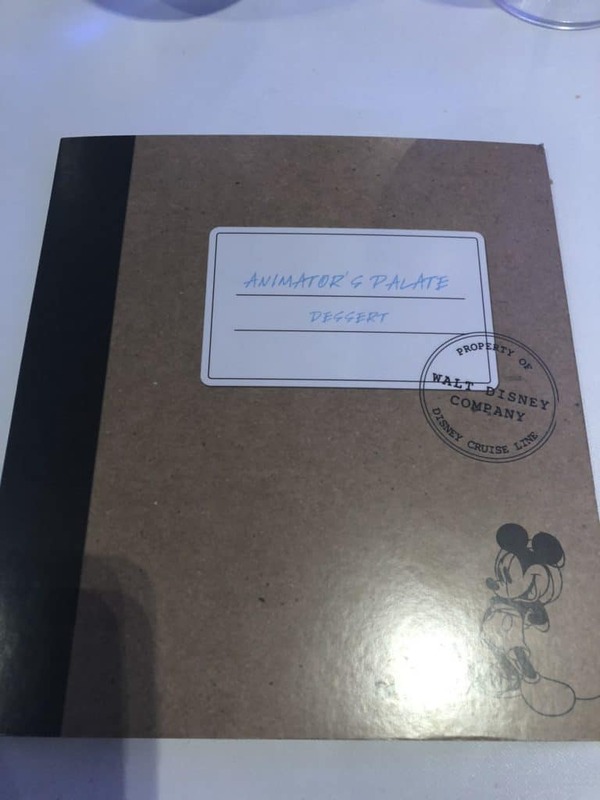 I was looking forward to our second night in Animator’s Palate. 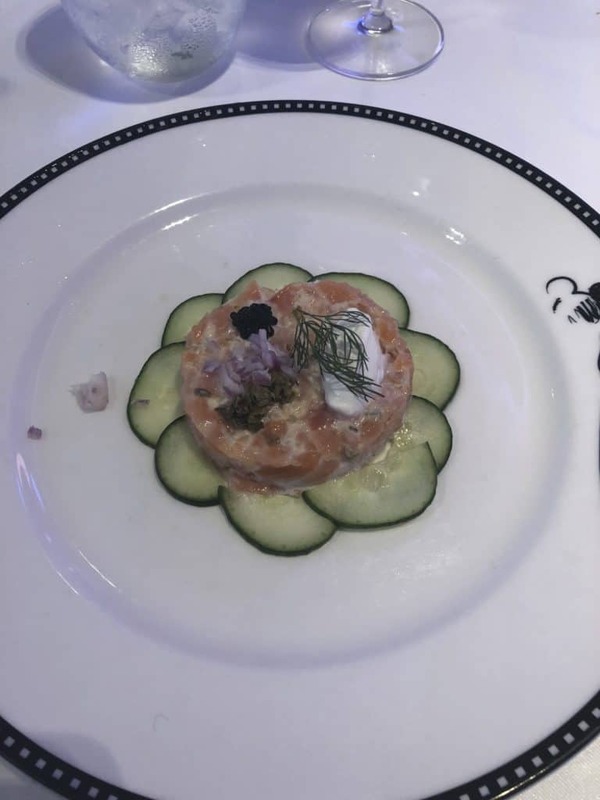 From previous cruises on the Disney Wonder I know that I really like the Smoked Salomon Tartare. It didn’t disappoint. 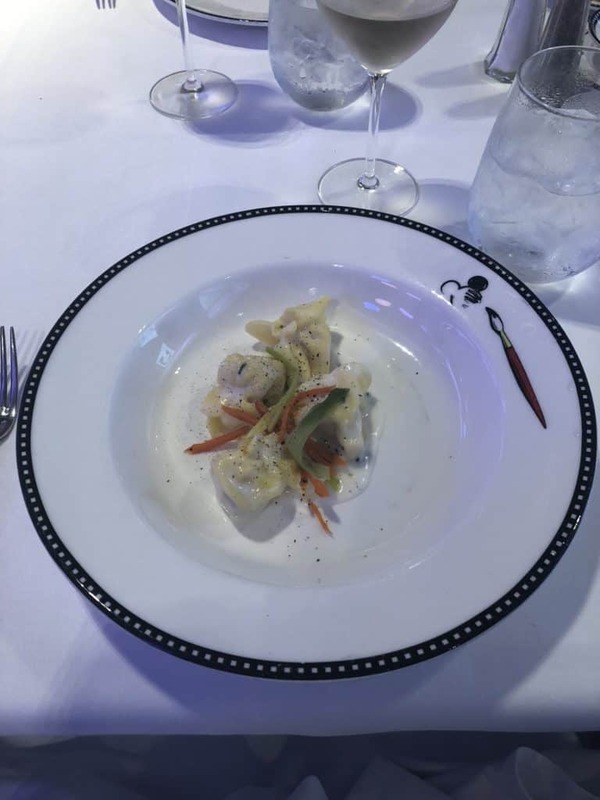 I think this is one of my very favorite appetizers on the Disney Wonder. DH had the Black Truffle Pasta Puseittes which he said were just OK. 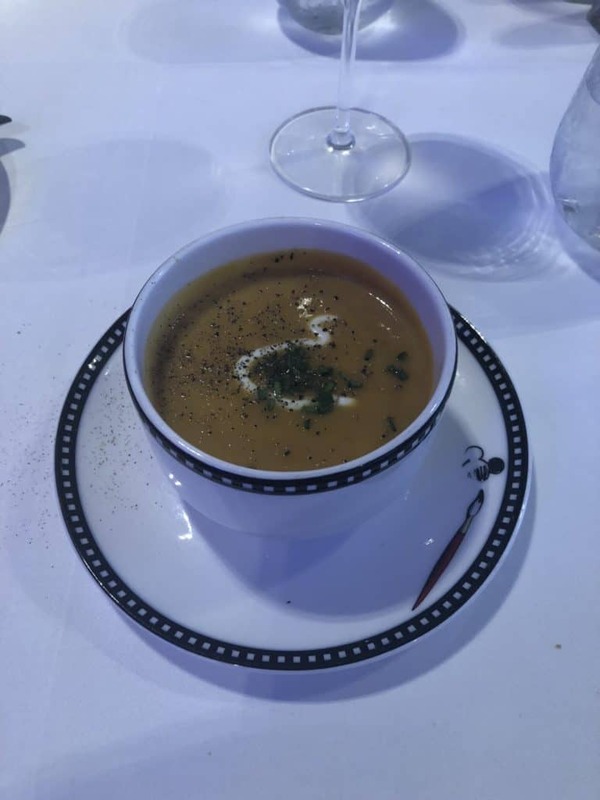 The Creamy Butternut Squash Soup is also really good. 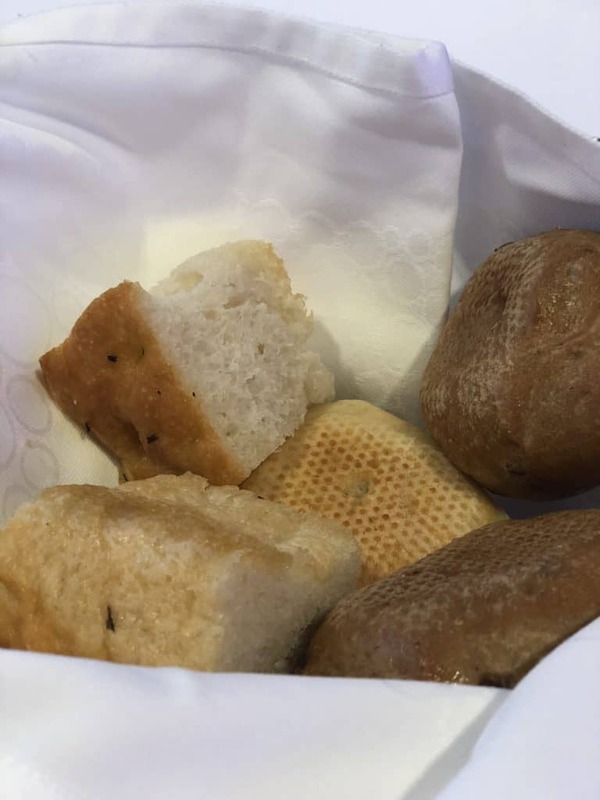 Usually one of the great features of dinner on a Disney cruise is the bread. Tonight it was pretty ordinary, but of course still really tempting! For the entree I really couldn’t decide on something that I wanted. I know that I really do not like the Black Bean Chipotle Cakes very much. I usually opt for the fish, but I really do not like tuna. I decided on the Sesame Halloumi Parcels with Sweet Potato Tahini Mash and Roasted Cherry Tomatoes. I did notice that Netasha our server did not seem enthusiastic about this. I should have taken more notice of her! I really thought I would enjoy it as I love Halloumi. However, the pieces of Halloumi were so tiny you actually had to search for them! 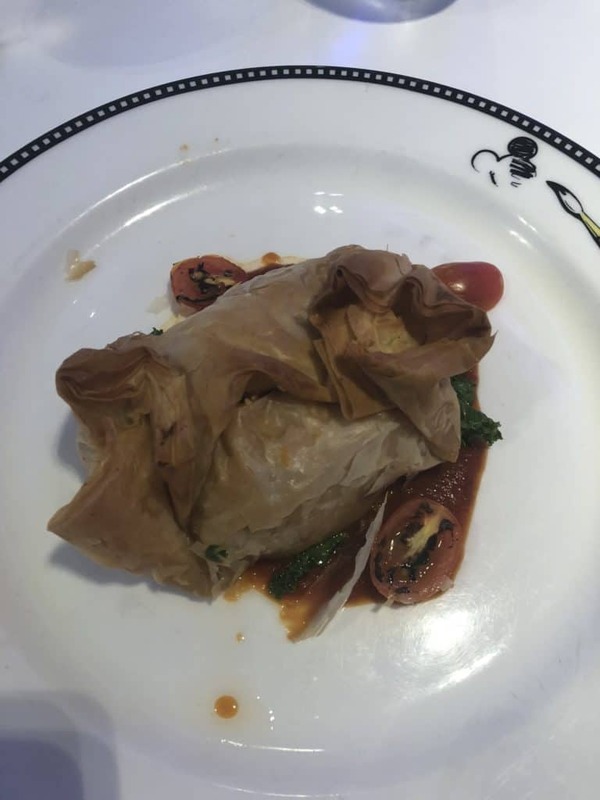 The dish was fine, but really had very little to do with Halloumi. The filling was mostly Sweet Potato Mash which was fine, but it got rather boring as this was by far the dominant taste. 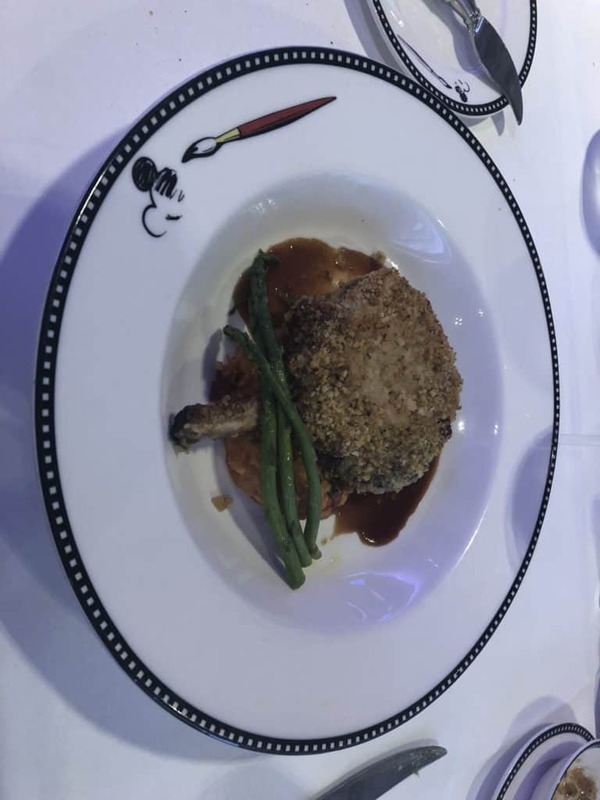 DH had the Herb Crusted Pork chop which he really enjoyed. Now it was time for the dessert. 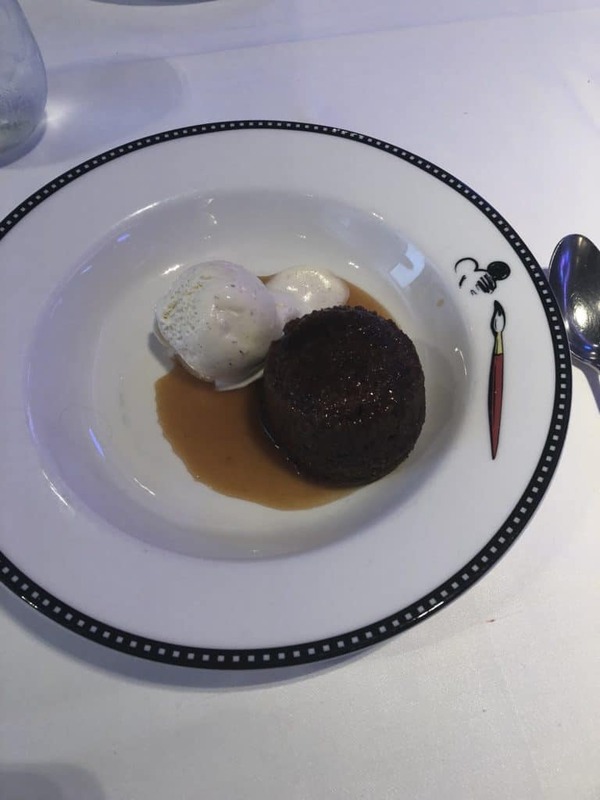 I had the Warm Sticky Date Pudding. It was fabulous although I was so full by the end of the meal! DH opted for the Cookies ‘n Cream Sundae. 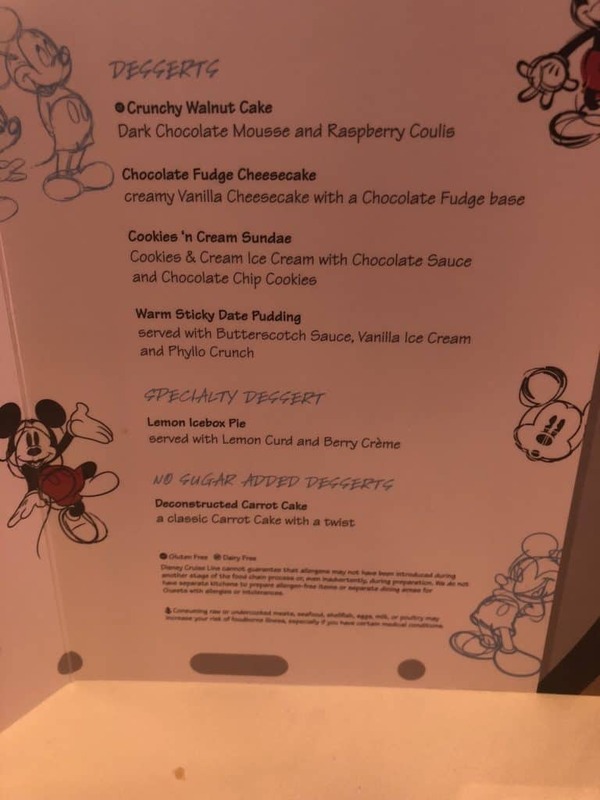 During dessert was my very favorite Disney Wonder restaurant experience. The appearance of Mickey Mouse! He parades around the room and then all the servers join him. It is always a special moment and I have to say I always get emotional at this point! I have sailed so many times on Disney cruises and particularly the Wonder. Sometimes that has been during some very difficult emotional times for me. This celebration with Mickey just always makes me happy and feel thankful. Disney fans will know what I am talking about! My one disappointment is that they do not have the servers carry out the flags any more. I used to love that part. Our now retired server Dinesh always used to get the British flag out for us. I asked Netasha why it was gone and she said she didn’t know but was sad about it too. Unfortunately Mickey moves so quickly I did not get a good picture! 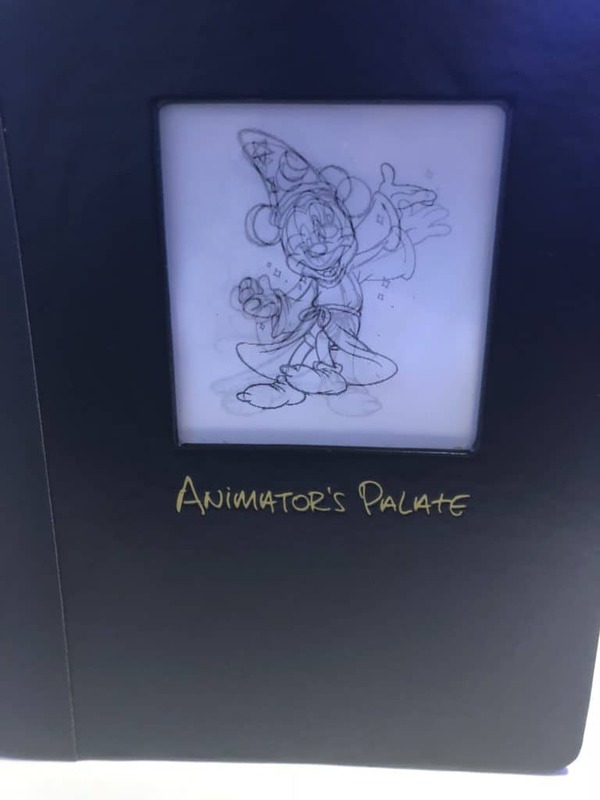 Here are some pictures from around the room and outside of Animator’s Palate just to show you how amazing the detailing is. Take some time to walk around Animator’s Palate just to see how much attention to detail there is. The last day is always sad as you just don’t want to get off the ship. If you want your luggage to be carried off the ship for you then you have to have it packed and outside your stateroom. The bags have to be outside your stateroom no later than 10.30 pm. You will already have luggage tags which have been left in your room for you. If you do not want your luggage collected you can use Express Walk Off. What this means is that you can get off the ship as soon as it has cleared Customs. This is usually pretty early in the morning at around 8.15 am. I had already packed and so we decided to do our usual walk around Deck 4. 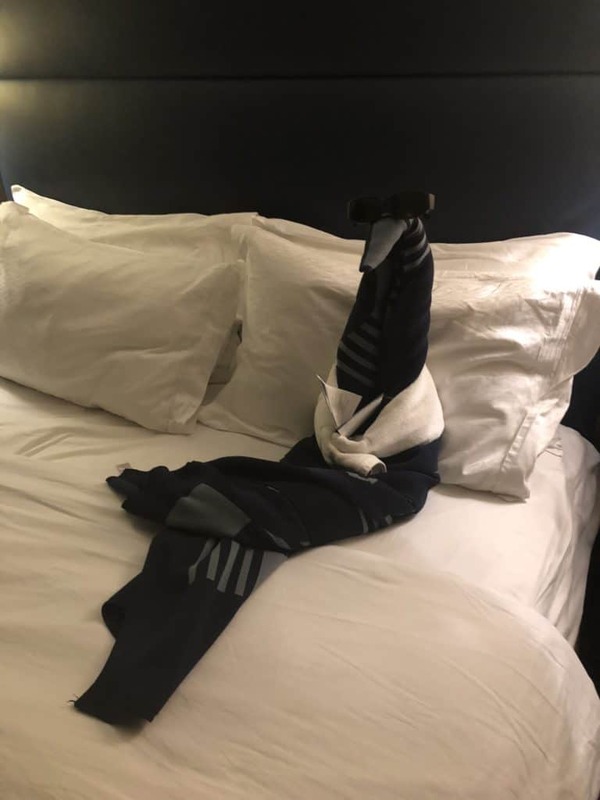 We returned to the stateroom to find a great towel animal. One of the advantages of late dining is that on your final morning breakfast is a little later. If you have early dining breakfast is either at 7.00 am or 7.15 am. If you have late seating it is 8.15 am or 8.30 am. 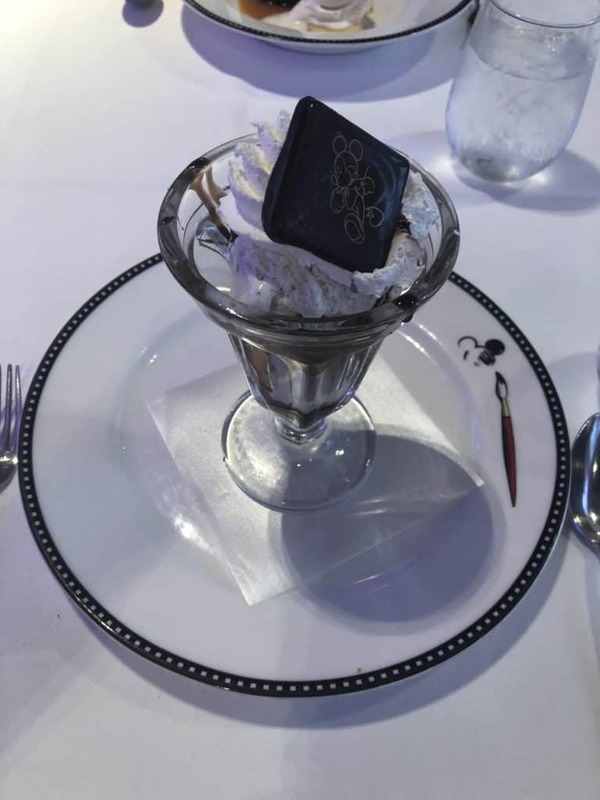 Your servers will remind you that breakfast will be in the same dining room as you dined on your last night on the cruise. I am not sure what tine we arrived back in San Diego in the morning. However, by the time we got up we were docked in the port. 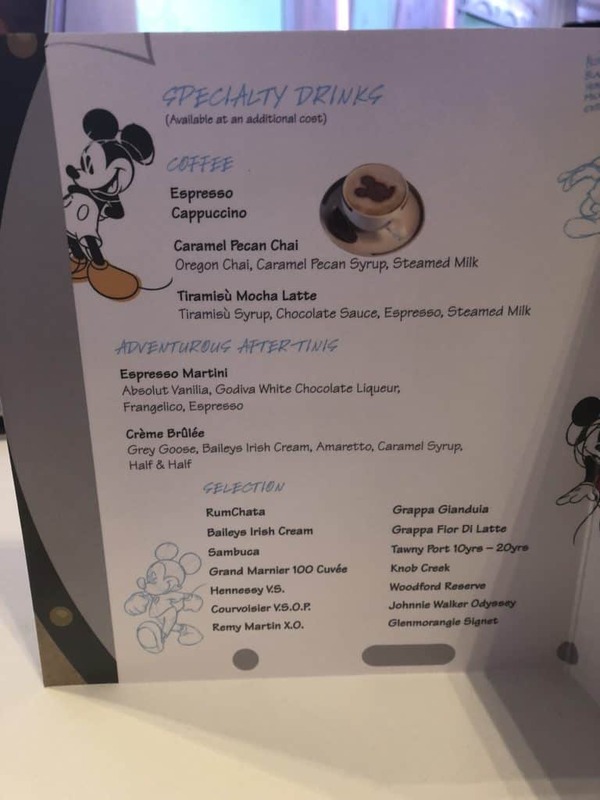 We had to be at breakfast at 8.15 in Animator’s Palate. So we checked around the room and said one last goodbye to our stateroom. I am sure that we will be back soon. Breakfast on the final morning is always a bit of a sad occasion. No one wants to get off the ship. Breakfast always seems very hurried too. I know it has to be as they need to get ready for the new passengers coming on board. 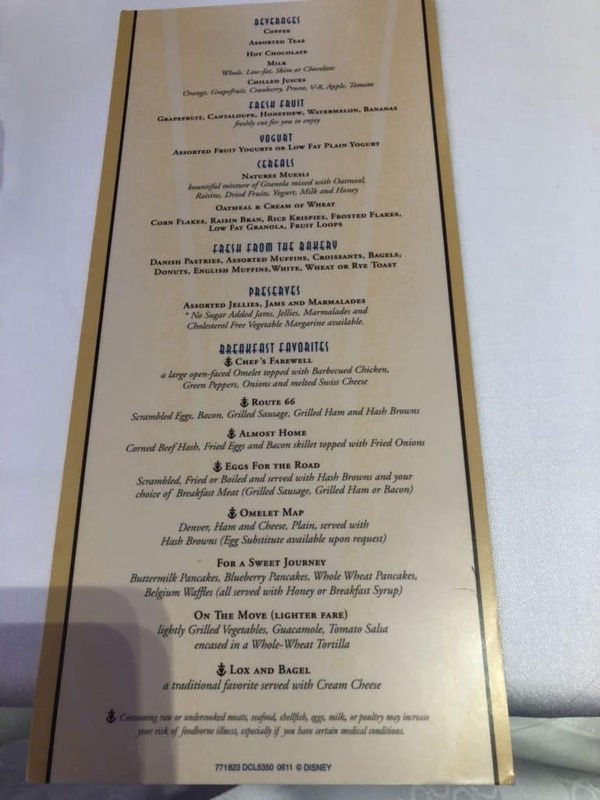 I realized that I only took a picture of the menu. Obviously I was feeling too sad to remember to photograph the food! We finished our breakfast and said our goodbyes. Just as we were walking out of the restaurant we heard our luggage group being called. I hadn’t expected that as usually there is a bit of a wait. 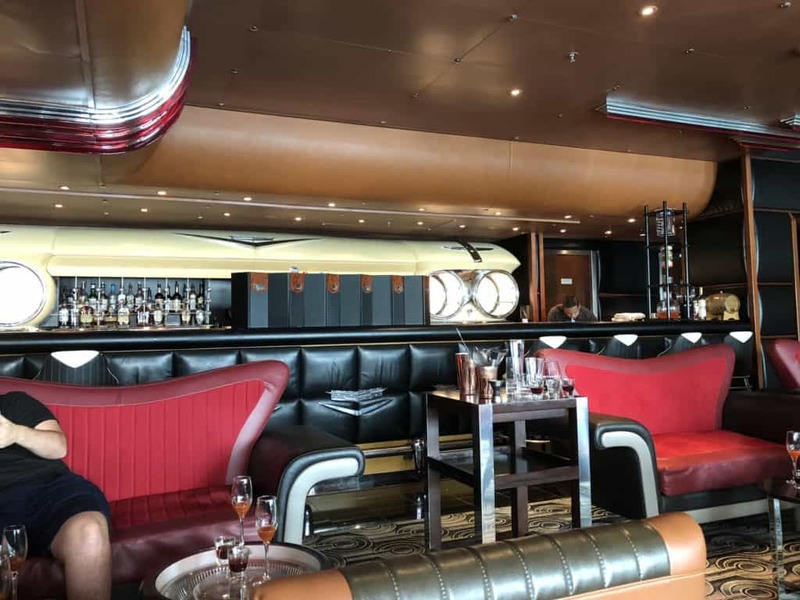 However, it was great timing as we could just walk through the Promenade Lounge and off the ship. We were both very sad to leave. However, I know we will be back. I am so glad that there are San Diego Disney Cruises which can be booked until 2020. I know we will be sailing on many more!